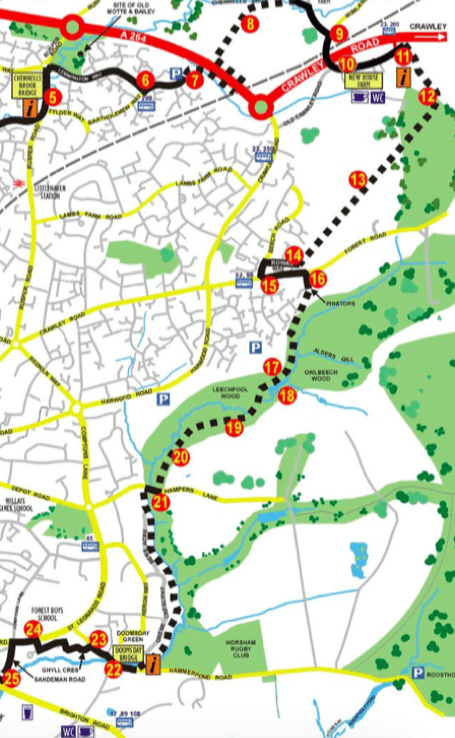 Between 15 and 21 on the map are Owlbeech and Leechpool Woods. Travel writers at the Guardian have recognised Leechpool and Owlbeech Woods as top “hidden gem” destinations in the world for 2017. Horsham District Council's website gives more details of this HERE. (10) From New House Farm turn right into Old Crawley Road and follow a footpath between houses (11) on the right, up a hill and into a gap in the trees (12). Go straight ahead through woods and across a field (13) before entering trees again. Follow the path to Rowan Way (14) and left into Beech Road and again left at the roundabout (15) onto Forest Road. About 200 m. on the right (16) turn into 'Pinetops' and follow the path going left of a house. This leads down across a small field, through trees and down to a made up path. (17) Turn right and follow this past a notice board, downhill and follow the large sign for a Woodland Walk pointing to the right. (18) Pass Leechpool Pond on the left and continue slightly uphill to go straight ahead. This leads to a boardwalk, back to a path, and left where two posts point downhill. (19) Cross the river on the boardwalk, which carries on to criss-cross the river, with a final bridge leading up to some steps (20) to a path which leads to Hampers Lane (21). Turn right and after 50 m. turn left and before the other side of the field turn left again. The path follows the river and runs parallel with Bens Acre and Grebe Crescent. Continue on this uneven path eventually passing 3 bench seats (100m apart) and over a bridge where the path goes right to meet up with Hammerpond Road (22). (22) Follow the path through the trees, over a footbridge, across a field and into trees for a walk on a rough path that follows the river, and which runs parallel with Grebe Crescent and Bens Acre. The path emerges onto a field that leads to Hampers Lane and turn right here (21) and after 50 m. turn left to lead down to a boardwalk. This leads to another path, then over the river to pick up a long boardwalk (20) which criss-crosses the river. At the end (19) walk up the hill and meet a path where the walk continues to the right. Follow this past Leechpool (18) pond on the right and go around woodland signs (17) to continue up a slope to pass a notice board. After 200m and before this track bears round to the right there is a left turn that leads up and across a small field. Continue past a house on the left to a road called 'Pinetops' (16). This leads to Forest Road and turn left here and right at the roundabout (15) (Beech Road). Turn right again into Rowan Way (14) and at the far end turn left into an alleyway that leads into trees. Continue, bearing right, through more trees and cross a field (13) to enter woods. This path emerges on the other side where a path going left (12) leads down to a pathway between houses (11). Turn left into Old Crawley Road and New House Farm Shop is along on the left (10).